CRCD Academy Teachers took our Students on a camping trip for Winter Break. Our Students were able to enjoy the outdoor adventures of hiking and exploration in the mountains while bonding with each other. Do you know someone 16 – 24 Years old who could use a FREE HIGH SCHOOL EDUCATION? Send them over to CRCD! We have orientations every Monday at 3pm and Wednesday at 1pm! Call 213-743-6193 x210 for more information! Live between Slauson/ Washington and Alameda /110 freeway and you must have children 7-17 years old. On December 7, 2016, All Peoples Community Center attended the Vigil at the Japanese American Cultural & Community Center. Our name All Peoples means that All are welcome so it was important to stand in solidarity with our diverse Community Members. In response to the need to both process the recent election results and to respond to the increase of hate crimes against Muslims and immigrant communities, the Nikkei for Civil Rights & Redress (NCRR), the Nikkei Progressives (NP) and the Vigilant Love Coalition are sponsoring a vigil this Wednesday, December 7, 2016 in the Plaza of the Japanese American Cultural and Community Center (JACCC) at 5:00 PM. We pledge to make Little Tokyo and all communities a safe place no matter a person’s race, religion or gender preference. We pledge to see Little Tokyo as a welcoming place – as long as they take their shoes off. We are Muslims. We are immigrants. We are People of Color. We are Sikhs and Jews. We are LGBTQ. We are marginalized. We are women and we all stand together. A Global Day of Giving. November 29, 2016 was #GivingTuesday. In order to help continue to provide for the children and families in our South Los Angeles Community, we have extended our #GivingTuesday goals until the end of this year. $8 will keep a Child warm this winter with a coat. $17 will provide a Child with a Team uniform so they can participate in a sport. $30 will feed a family of 4 for One Month. $200 will support Science Project materials to educate Children. $200 will keep 25 Children warm this winter with coats. $200 will provide Team uniforms for 12 Children. $250 will support One week of an Outdoor Camp experience for One Child. $330 will provide One Child with 6 weeks at Summer Day Camp. $450 will provide a bus for a field trip for 60 students. $1,000 will help a Victim of domestic violence and Children relocate to a safe environment. $1,500 will help provide lunch for 1,000 Community Members at the Annual Health Fair. $2,000 will help support a senior recognition lunch. $2,000 will support a screen and projector for All Peoples Community Center. $3,000 will feed 100 families for One Month. $10,000 will give a weekend family camp experience to 12 families. Real Solutions, Real Heart, Real Service to South LA since 1942. On Saturday, November 19, 2016 All Peoples Youth participated in the United Way Annual HomeWalk to help end Homelessness. Thank you to All Supports and Participants! Together we can end homelessness. 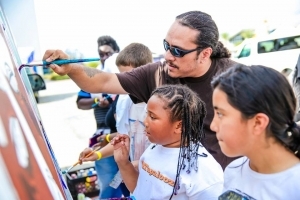 On Saturday, October 29, 2016, the California Community Foundation hosted the PATapalooza festival to celebrate five years of Preparing Achievers for Tomorrow (PAT), an initiative whose grantmaking investments have supported the social and emotional development of more than 12,000 South Los Angeles and South Bay young people. All Peoples Youth hosted a Community Mural at the Festival. All Peoples Community Center is hosting our Annual Thanksgiving Day Dinner for our South Los Angeles Community. We have invited participants from multiple programs of the Center; daycare/preschool, continuation high school, youth after-school, Adult Programs: parenting, parent support groups, supplemental food program participants and senior volunteers. Thanksgiving Day Dinner will be held Wednesday, November 16, 2016. Doors open at 2pm and families will be served from 2pm – 7pm. Volunteers are needed between 10am and 8pm. Volunteer assignments include, but are not limited to slicing pies, decorating tables, check-in, seating, serving food and/or drinks and clean up. Please contact Teresa Yamamisaka to sign up to volunteer or for more information at 213.747.6357 ext 123 or tyamamisaka@allpeoplescc.org. **FOR INDIVIDUALS THAT ARE UNABLE TO VOLUNTEER, WE ARE ALSO ACCEPTING FINANCIAL CONTRIBUTIONS. PLEASE CLICK THE “DONATIONS” LINK BELOW TO MAKE YOUR DONATION. THANK YOU FOR YOUR CONTINUED SUPPORT! ** PLEASE CONTACT TERESA YAMAMISAKA FOR ALL IN-KIND CONTRIBUTIONS! We have one thing to say to our All Peoples Family and Sponsors. What a great year we are having, and it is due to all of the encouragement and support that you, our All Peoples Family and Sponsors have given us. We are honored to announce that All Peoples Community Center has been rated one of the Top Non-Profits in the Los Angeles area for 2016! One of the city’s oldest and most trusted place-based community organizations, All Peoples improves life for the diverse residents of South Los Angeles by providing a comprehensive range of vital services, grass roots leadership, problem solving and authentic hands-on care to children, youth and their families. We assist thousands of children, youth and adults every year by offering after school programs, emergency food distribution, parenting support groups and a safe place for all residents to use as a platform for success. THANK YOU again for your continued support. Together we move forward towards continued success here at All Peoples Community Center! For Donations or In-Kind Contributions, please contact Shalanda Mays at 213.747.6357 ext 124 or smays@allpeoplescc.org. Thanks and we look forward to seeing you there! What is the average class size and the student-to-faculty ratio? Are most classes taught by professors or by teaching assistants? What is the campus meal plan like? How is the food? What are the options? What is the makeup of the current freshman class? Is the campus fairly diverse? What’s the social scene like? What kinds of activities are available? Is there plenty of dorm space or is there a housing crunch? How many students are commuters and how many are campus residents? “One of the most compelling and important reasons for taking the students and parents on this tour was so that they could see the college firsthand – the classrooms, dorms, and library that the students would be living in for the next four years in the event that they were to commit to these universities,” says Deisy Huerta, Youth Director at All Peoples Community Center. “Students and parents had an opportunity to see the buildings inside and out, including classrooms, dorms, dining halls, gyms, and libraries.